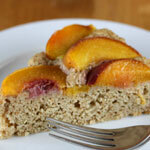 A light spongey almond flavoured cake is topped with ripe juicy peaches in this low sugar peach almond cake. Make this when peaches are at their ripest and lay them on their side across the top of the cake to show off the beautiful gold and red colours. Preheat the oven to 350 F. Grease and flour an 8-inch round cake pan. In another bowl, whisk together the egg, milk, applesauce, vanilla and almond extracts until creamy. Slowly add in the melted butter, whisking until blended. Add wet ingredients to the flour mixture and stir just until evenly moistened. Do not overmix. Arrange the peach slices on top of the cake in circles, starting at the outside and working your way in. Press lightly into the batter. Bake the cake for 40 - 45 minutes, or until a toothpick inserted into the centre of the cake comes out clean. Cool on a wire rack in pan for 20 minutes, then invert onto wire rack to release from pan, and then place another wire rack on bottom of cake and flip over so peaches are on top. This cake can also be made using an 8 or 9-inch springform pan. If using springform pan, let cake cool for 20 minutes then gently remove sides of pan. For a sweeter cake, replace the 1/2 cup of unsweetened applesauce in the Mildly Sweet recipe above with 1/4 cup sugar. Whisk the sugar in with the egg, milk, vanilla and almond extracts in step 3. Omit the unsweetened applesauce. Adapted from: Peach Streusel Coffee Cake from The Williams-Sonoma Baking Book: Essential Recipes for Today's Home Baker.